Polsloe Priory, also known as St Katherine's Priory, was a Benedictine nunnery, founded around about 1159 and dissolved on 19 February 1539. It was one of only three priories in Devon to be founded by nuns. The original priory consisted of four main buildings around a quadrangle or cloister – a licence had been obtained for a burial ground when it was founded. The Priory was dedicated to St Katherine of Alexandria. The priory relied on rent from land in Polsloe, Cokesputt near Payhembury, Tudhays in Colyton and others, one of which was in Somerset, with an estimated income in 1635 of £164 8s 11¼d. 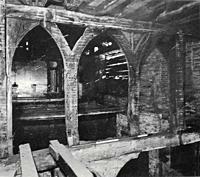 The first buildings were of timber, but were quickly replaced by more substantial structures. The surviving building, which is thought to date from 1310 to 1330, is the main part of the west range. It was originally built in local breccia and then rebuilt in the early 14th Century in the local sandstone. 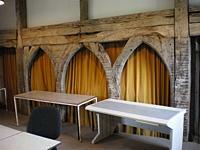 The ground floor was used as a storeroom with a parlour, while the upper floor was accommodation with a garderobe. 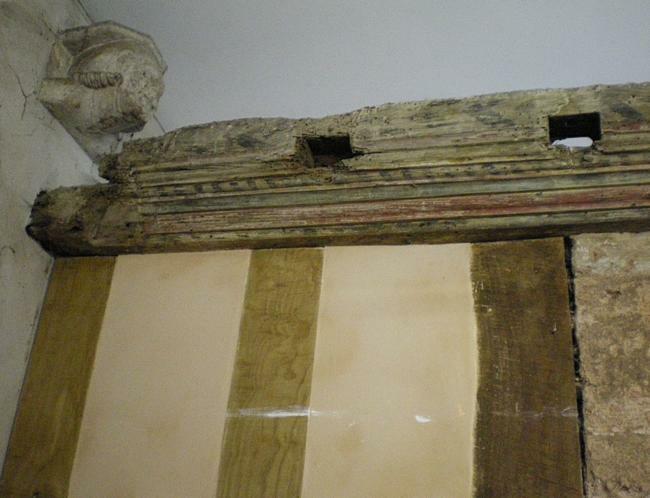 The building has a 13th-century fireplace and has two stone corbels, of the same age, one of a man's head, and the other a woman's, both with carved head-dresses. Bishop Grandisson's Register records the election of a new prioress, Juliana de Bruton on 1347 by twenty-one nuns, or rather twenty as two were found to have died. The Priory was never attached to a abbey, and hence, even with various estates paying tithes, the nuns were always pleading poverty. To supplement their income, they would accept peskendinares or paying guests. In 1397 they accepted Sir Henry Champernoun as a paying guest. A further discovery in 1934, during the excavation by the archeologist, Mr A W Everett, was a large number of glazed floor tiles. It emerged that two of the designs were of St Katherine's wheel and the sign of Sagittarius. The latter design depicted a centaur holding a bow in the right hand and an arrow in the left, with a helmet on the head. It was noted that the festival of St Katherine was on 25 November, under the sign of Sagittarius. 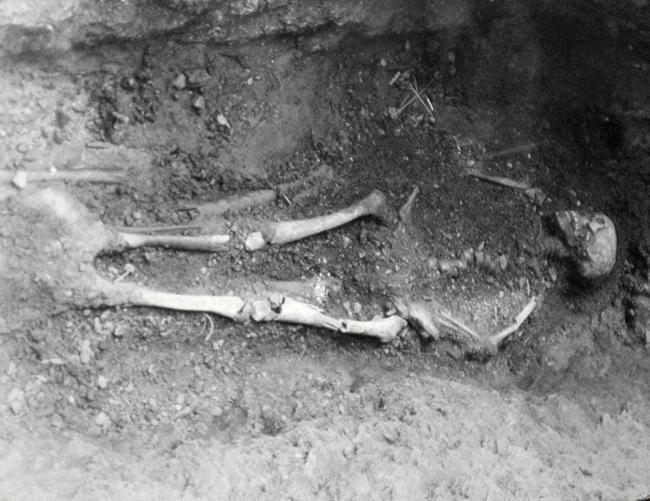 During the same excavations, a neatly-lined stone grave was discovered containing the skeleton of a man believed be Thomas Bannaster, the last chaplain of the Priory, who died about 1534. He had left money in his will to care for the nuns, which was just in time, given the change of circumstances they would find themselves in 1538. Further female skeletons were found in the cloister, who were probably prioresses. The Mincinglake rises above Mincinglake Bridge on Stoke Hill and enters the Exe at Northbrook Park, where it is named the Northbrook. Many locals know it as the Panny. The stream ran past the Priory – the name was derived from the Anglo Saxon word moenchin, meaning nun. 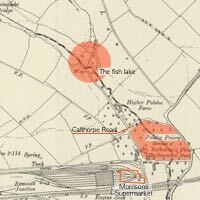 The nuns dammed the stream further up the valley to create a fish lake, hence the nuns lake. The dam was investigated in 1936 by A W Everett who found that it was a curved construction of stone and earth, and measured 350ft in length, 140ft wide at the base and 30ft at the top. The lake covered an area of six acres and contained 15,000,000 gallons of water, which also acted as a mill pond for Polsloe Mill, a grist (corn) mill, at what was once Higher Polsloe, since demolished. The lake flowed through a small orchard before entering the lake. The lake was used as a tip after the war, and then the city council landscaped the area for the park. The dam is still visible, but all other traces have gone. The site of the mill is though to have been at the rear of a house called High Polsloe. After the Priory was dissolved at the command of Henry VIII in 1538, Polsloe came into the possession of Sir George Carew and his wife on the 1 February 1542, at a rent of £29 3s 1d. It later passed to Sir John Carew, then John Petre an Exeter merchant and later Sir Arthur Champernown, (whose ancestor had been a paying guest), of Modbury. In 1609, he exchanged it with Nicholas Aylesworth, merchant, of London, for the more noble seat of Dartington Priory, near Totnes. Polsloe Priory, by which it was then known, became the residence of Colonel Sebastian Isaac, who is responsible for demolishing the church and some of the buildings. 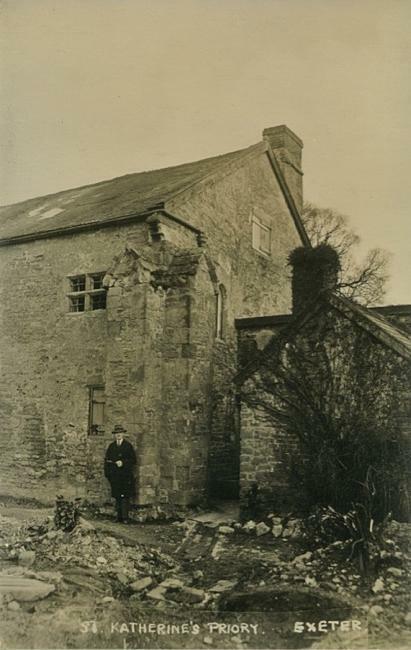 In the latter half of the 19th Century, the Priory was used a farmhouse. In 1899, the brothers A and H Bradbeer established the Exeter Brick and Tile Company, in Polsloe. In 1932, the Bradbeer's purchased the building with a view to demolish it, for a row of working class dwellings. The brothers realised the historical importance of the Priory, due to Miss Lega Weekes, and offered to sell the building to the city, along with 2½ acres of land, but were turned down – yet another example of the disdain the City Council have held for the historic heritage of the city. At a meeting of the Devonshire Association, in 1934, a plea was made by Miss E Lega Weekes to save the building. When she first saw the site, an ancient barn was standing with a ponderous oak roof in a dangerous condition and she "had the chagrin of seeing the whole levelled to the ground." In September 1934, it was announced that oak panelling from the Priory was to be removed, and installed in a committee room, at the rear of the Guildhall, where it can be seen today. The panelling was the gift Mr. Harry Bradbeer. The Bradbeer brothers then decided to give the Priory and land to the city. The building was one of only two in the country to be listed as an ancient monument during 1938, largely as the result of Miss E Lega Weekes work. Mr A W Everett, was appointed as the custodian of the Priory, assisted by Exeter model maker Mr E G P Oddy (who would later make the model of HMS Exeter in the White Ensign Club, South Street). 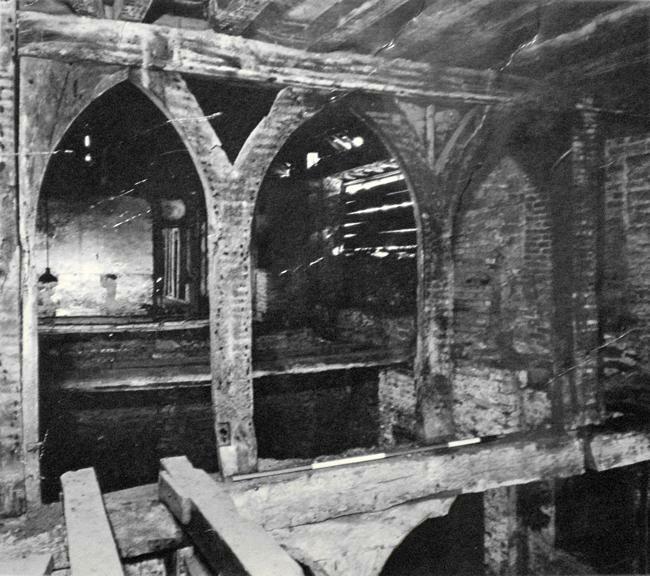 In 1946, Mr Everett reported that excavations to put in drainage for a nearby housing development had uncovered a medieval bridge to the west of the building that had been used by the nuns to reach the eastern banks of the the Mincinglake, along with some graves of the nuns. It was used as a store and then from 1980. It still belongs to the City Council and is leased to the Stoke Hill Community Association as a community centre. 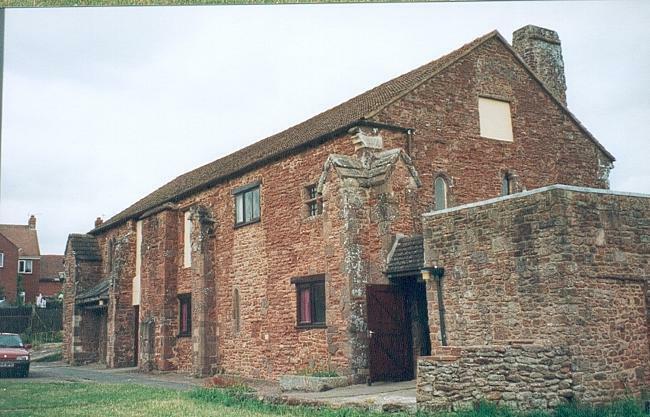 The priory was excavated during 1976-77 by Exeter Archaeology. Excavations found that 25% of pottery shards were imported, while 10,000 domestic fowl, goose, ling, conger eel and hake bones from the early 16th century were found. Whole and half carcasses were brought in, suggesting that animal slaughter was done elsewhere. The final butchering of the carcasses was probably done by men, as the tools of the trade were expensive. The original cob wall that surrounded the Priory still exists, and the visitor passes through an ancient entrance gate into the grounds. 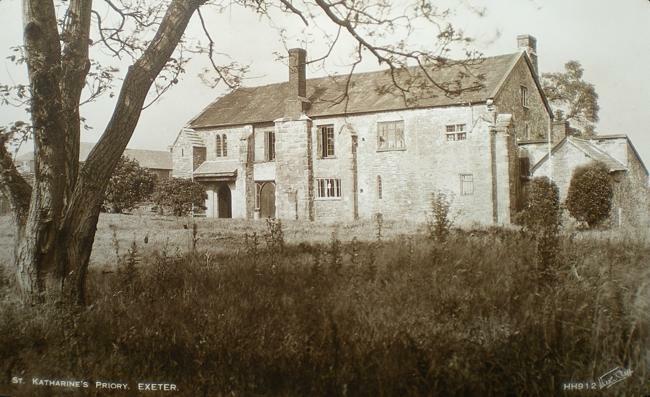 The building was Grade II* listed on 29 January 1953, and is located at St Katherines Road, Exeter, Devon EX4 7JY. Sources: Western Times, Western Morning News, Memorials of the City of Exeter by Richard Izacke. Gender and Material Culture: The Archaeology of Religious Women By Roberta Gilchrist. The Churches of Medieval Exeter By Nicholas Orme. The Priory as it is now. Postcard showing the southern end of the Priory. Another postcard, probably from the 1930s, after it was saved. 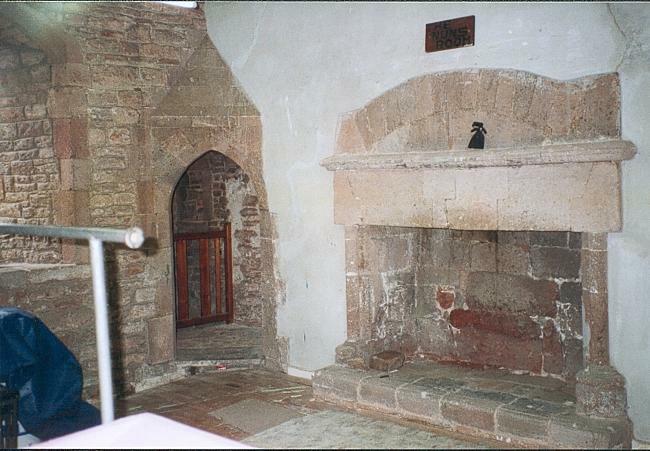 One of the fireplaces in the Priory. An internal oak screen before the Priory was restored. The same screen after restoration. One of the human bodies discovered at the Priory. 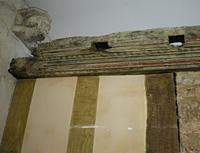 Many of the interior timbers were decorated with colour. One of the stone corbel's mentioned in the text is top left.